You would imagine that kindness is not a thing that would go out of fashion, yet it somehow has, or it has certainly seemed that way. There is something quite harsh and uncaring about Social Media, an arena where many people now spend a good part of their time. There has also, for a long time, been a very narcissistic self-obsession in popular culture. Whether physical, emotional or spiritual, the emphasis has been on self improvement; perfect diets, gym bodies, perfect show families, mindfulness. In essence, the impetus has been to focus entirely on yourself and often in a sense of how you appear to the outside world. And whilst none of the things I have mentioned are inherently bad (they are pretty good a lot of the time), the whole package together just seems to have led to a firm placing of our own egos at the centre of the universe. And with that comes an inevitable loss of care for other people. This loss of care is so evident online - if you make the mistake of looking into comments on any kind of controversial topic, you will see so much vitriol and absolute self assurance from the most stupid and ignorant of people. This is a whole other topic in itself but it's pretty obvious that kindness and tolerance is the last thing on their minds! It's not just online though, in real life also, people have become impatient and intolerant. Living as I do in a small town, it's perhaps not so evident, but I certainly can see how rude and pushy people can be in the city when I'm there. (Not that people are perfect where I live either, it's just that the pace is a bit slower and doesn't lend itself to rudeness in general) I'm not exempt either - I've done the eye rolls when someone is not quick enough in a queue or asking pointless questions of the cashier. This is not a good thing though, and it's me just giving into impatience, which is pointless. This kind of scenario doesn't merit an actual act of kindness, more a mental adjustment to be a little nicer. There are lots of scenarios though, where you can do little things and they can mean a lot - hold the door open for someone, help them with bags, offer a lift. Just smile at someone! Don't make instant judgements based on what people are wearing, or their accent or general demeanor - let's face it, you have no idea what kind of day they are having or if they are going through a hard time. I've also noticed, and become less tolerant of, narcissistic people in conversation. I honestly don't know if this is a new phenomenon or if I'm just getting older and grumpier but conversational style seems to be more and more 'talk about myself, talk about myself some more, blah, blah' - which is not actual conversation because this is a two way street and requires some interest in the other person. Linking in again to the self-obsession and lack of kindness that seems to be common now. It's amazing how good a nice engaging conversation can make you feel and it's lovely to think that someone might be interested in what is happening with you, so it is an act of kindness itself to make that effort and properly engage with someone. Being kind is not a thankless sacrifice though. There is plenty of evidence to suggest that being kind is actually very good for us - it boosts your serotonin, lowers blood pressure, reduces anxiety and generally makes you feel positive - you can read more detail here. If only for those reasons, it's worth trying to be kind from time to time. Kindness is also a lovely thing that can make you stop and appreciate people, and it's so easy to forget to do this with all the rushing around we do. So I'm making an effort from now on to be consciously kinder - and don't get me wrong, I don't mean that we should stop calling out injustices or be passive, I just mean that we should take another look at all the people in our lives and around us in real life, and see if we can brighten their days a little bit. or Parenting Teens, some life-saving tips. 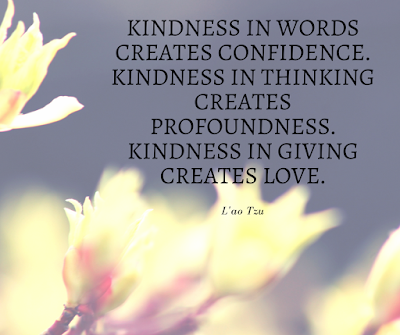 There definitely needs to be more kindness, consideration and acceptance in the world. It baffles me that even now, people are still mean about what someone is wearing or how they look, as if that's any form of reflection on the person they are or the day that they're having! I actually find that most of the time social media is a really supportive and kind place - perhaps I've just been extra lucky! I find that in 'real life' people are worse - particularly when I'm commuting here in London! The world could definitely do with some more kindness. It takes so little to be kind. Great post! I feel like kindness is getting rarer and rarer these days which really gets me down at times, it's a game of who can moan the most in some situations I've found myself in, instead of listening to each other and showing some semblance of kindness. I do try to put it out there in the world as I do believe you get back what you put out, here's hoping more people put kindness out in the world.